Even the heavens appeared to celebrate the long-awaited resurfacing of the sunken ferry Sewol. 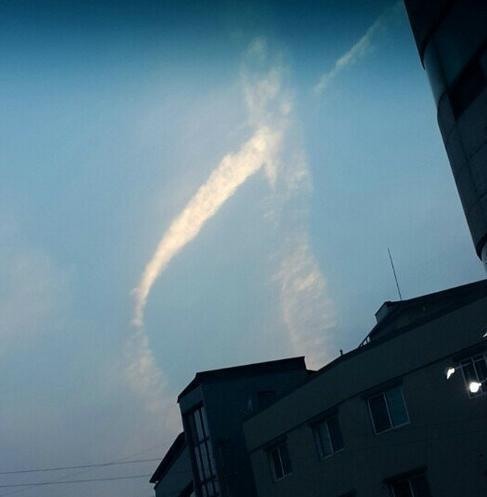 As authorities on Wednesday kicked off the salvage operation of Sewol, the internet buzzed with a photo of a cloud seen in Wonju, Gangwon Province. The cloud seemed to take the form of the yellow ribbon used to symbolize those who lost their lives in the Sewol tragedy. “It was sent by my brother-in-law in Wonju. What does it remind you of? I wish success for the salvage operation! !” said a netizen who posted the photo. The sinking of the ferry on April 16, 2014 left 304 dead or missing, most of whom were students of Danwon High School on a field trip to Jeju Island. The tragic accident left the nation in shock. Messages and videos of the victims -- some of which showed students playfully joking as they were unaware of how grave the situation was -- were posthumously revealed. Bereaved families have been calling for the ship to be salvaged, mainly to recover the bodies of the nine people who remain missing. The ghostly exterior of the ship started to resurface Thursday morning.